Paul Manafort allegedly spent $934,350 on rugs. How is that possible? How could Paul Manafort spend so much on rugs? Paul Manafort pleaded not guilty Monday to charges of money laundering and conspiracy in connection with special counsel Robert Mueller’s investigation into Russian meddling in the 2016 presidential election. This raised many questions, including: How is it possible to spend nearly a million dollars on rugs? And where could you do it? I started calling Alexandria rug stores and interior decorators once the news broke, contacting anyone who could help me understand where Manafort might have shopped and how easy it would be run up a seven-figure bill. I knew extremely rare rugs could go for millions of dollars. But the pattern described in the indictment was different: The purchases were made over the course of eight visits. I wanted to understand how someone could build such a collection. As I was a dozen calls in, HuffPost, which had a similar idea, published a story with several stores denying any business with Manafort. Yet it also had one intriguing lead: a store called J&J Oriental Rugs told the reporter that Manafort’s supposed rug transactions were “confidential” and that there was “nothing to be proved.” The interaction ended with the representative telling HuffPost to talk to the store’s attorney. I was at J&J an hour later to try my luck. The store sits on a leafy, postcard-worthy street in Old Town Alexandria that’s dotted with oyster bars, artisanal cupcake bakeries, yoga studios, and antique shops. The J&J building is one of the largest on the street—almost the size of a small warehouse. When I stepped through the door, which was flanked by two enormous Chinese vases, I was greeted by the seemingly infinite collection of rugs they had to offer. There were different piles for bathroom-size rugs, living room–size rugs, and rugs so big I don’t know what you could possibly do with them. Some were a single shade, while others featured dizzyingly complex geometric designs. A shopkeeper approached me and asked if I had any questions about rug sizes or prices. I asked him what their most expensive rug was, and he pointed to an approximately 10-by-20–foot silk rug that hung from the ceiling and covered almost the entire wall. The colors were dark and muted, and the design was a patchwork of squares that featured intricate tableaus of plants in fractal patterns, men on horseback, and delicate vases. It might very well be the Platonic ideal of opulence. When I asked for the price, he said it was $10,000. I then identified myself as a reporter and asked him if Manafort had purchased a rug there. He told me the shop doesn’t talk to reporters and walked away. But I left with one possible answer to the question. We don’t know if J&J is the store in question—other than its location and the suspicious-sounding answer, we don’t have any evidence to indicate that it’s the case—but if Manafort had spent nearly $1 million dollars on rugs at place like it, then he could have purchased 100 of these fabric mammoths. How big could his houses possibly be? Nasseri said that he had received “100 calls” from reporters on Monday even though he’s sure that Manafort never purchased any rugs from the store. I then inquired as to what $934,350 could buy in rugs. Nasseri said that it depends, since some rugs are mass-produced while others are handcrafted. “Our rugs are real works of art. Real antiques,” he told me, pointing to the shop’s most expensive ware: an approximately 6-by-10–foot rug that was crafted in Iran in the 1850s and costs $45,000. Though over 150 years old, its colors and angular designs were still clear and vibrant. Other rugs in the store are priced depending on age and size—the newest rugs are still around 20 years old. I came to realize why the question I was asking is so tricky. It’s a bit like asking what millions of dollars could buy you in paintings: You could buy a ton of reprints or spend it all on a single original work by Basquiat. 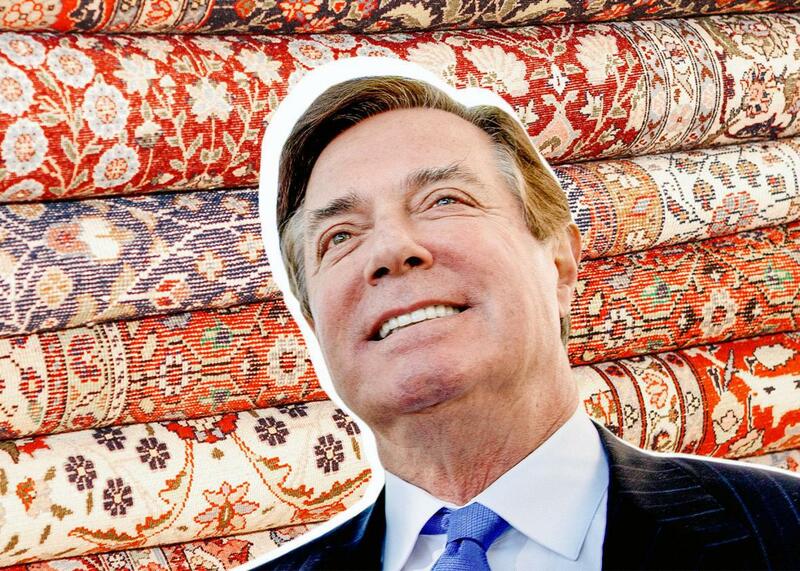 So perhaps Manafort was a rug connoisseur who was willing to splurge on a valuable vintage. Perhaps, as the indictment seems to allege, he wanted something that would appreciate in value. Or maybe he just had so much money that he could spend it on whatever looked pretty. Either way, here’s hoping the prosecutor schleps a gorgeous rug into the courtroom and submits it as evidence.